Choose the "Shop" button to view all of our gift items. If you already know what you want, and have the catalog item number or product description, use our "Search" feature located in the toolbar of our homepage. Our website is the most convenient way to place your order any time. Click here to download our order spreadsheet. Great for large orders! Click here to download our Catalog Order Form. Does your website offer secure ordering? 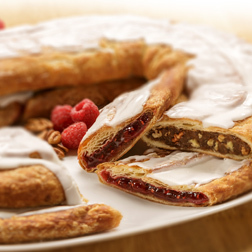 At Racine Danish Kringles, we offer a secure shopping environment. All information you enter on your checkout page, including credit card information, is encrypted while traveling the Internet so it cannot be intercepted for fraudulent use. We will use your information to process your orders and will not sell, share or distribute your personal information to third parties. If you prefer to place a telephone order, call us at 1-800-432-6474. We do accept checks and all major credit cards-American Express, MasterCard, Discover, Visa and PayPal. Absolutely! You can safely enter your credit card and debit information on our website. We have a secure server that encrypts the information you enter, and transmits it safely to us. Please call customer service at 1-800-432-6474 between 9:00 am and 5:00 pm CST, Monday through Friday, 72 hours prior to your scheduled delivery date. This may vary during the holiday season. Can I place an order on the phone and then mail you a check? Yes! We will hold the order until the check is received. How can I see my order history and order tracking information? Customers who have placed their order through our website will have the ability to login to view their previous orders. If you have placed your order by Phone, Fax or Email please contact our customer service to help you get order information. Can I place a reorder I've already completed? Yes! Provided you created an account with your initial order, there is a reorder option within you order history. Login to your account by clicking 'Login' in the top right navigation bar. Next, choose 'Order History'. All of your past orders (made with this specific account) will be listed by date. The contents of this order can be reviewed by clicking on the corresponding order number. Once you've selected the order you'd like to reorder, simply click 'Reorder' from the main Order History page. The order will be loaded in to your cart for hassle free checkout. Please note, you can edit these orders once they're in your cart, it will not automatically complete your purchase. Can I order to gift recipients on one order? Yes, just pick what you want to give them, and select "as a gift to" and put their name in and add to cart. Then, repeat for all of your gift recipients.